Christa’s twist juicer is rather pathetic. It clogs with pulp in seconds, and strongly makes us suspect nobody tried to juice anything with it before putting it on the market. 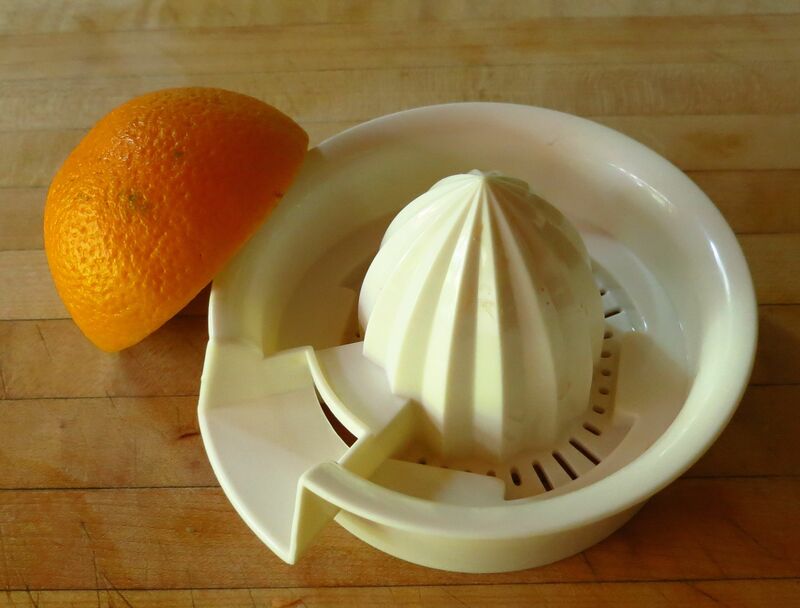 Hmph :S. Due to that, she sometimes uses her squeeze juicer to juice even large citrus like oranges and grapefruit. She’s noticed that doing that adds more peel flavors and bitterness to the cocktail, and that for some drinks she prefers it. 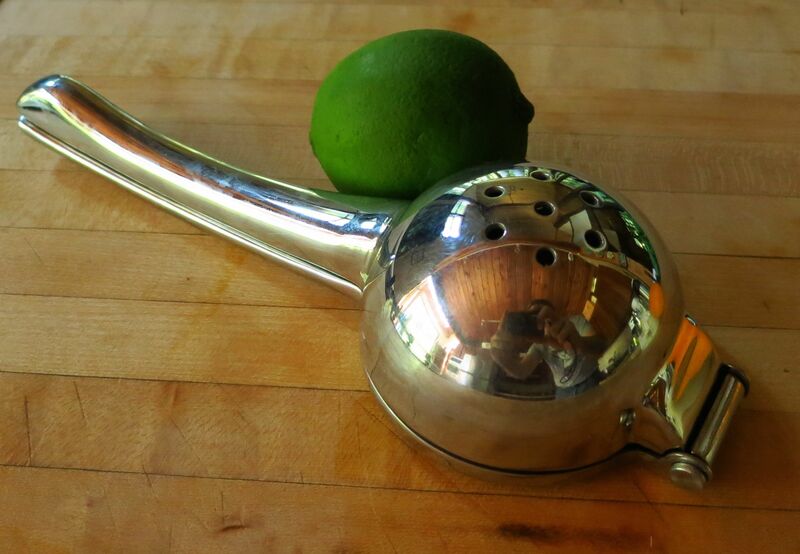 This made us curious to compare juicing citrus with a twist juicer vs. a squeeze juicer and how that affects a cocktail’s flavor. Being the Booze Nerds that we are, we decided to take an analytic approach and compare apples to apples. We made two versions of a given drink, one with juice from a twist juicer and one with juice from a squeeze juicer. Read on to find out what difference (if any) that made. We wanted to try one cocktail with orange juice and another one with grapefruit to see if there was any difference in how the larger citruses reacted to press squeezing. We browsed through our recipes for some simple ones that featured these juices. We first lit upon the bourbon-based Louisville Cooler, a basic four-ingredient cocktail that features orange juice fairly prominently. Nose: Roasted corn and corn meal, alfalfa hay, little bit of orange, tiny hint of lime. Palate: Sweet mild orange to start, then dry toasty corn. Creamy maple on the mid-palate, with a quick hit of lime into the finish. Aftertaste is more toasty corn flavor. Nose: Much stronger orange peel notes. Bourbon notes are the same (roasted corn and hay) but milder. Lime stands out slightly more. Palate: Strong orange, then candied citrus peel (like the bits of citron you get in fruit cake). Toasty corn and maple on the mid-palate, but not as pronounced as the first version. Lime barely speaks up at all. Long bitter orange peel finish. Shaun finds the peel notes/bitterness more overwhelming than Christa. The squeeze juicer brings a lot more pungency and bitterness to the drink, to the point where it is almost overwhelming. Being obsessive as we are, we then decided to try a blend of the two drinks with the differently made juices. A 50/50 blend was still very bitter, but one with approximately 25/75 squeeze juicer to twist juicer juice hit a nice balance. The added peel flavors from the squeezed juice expand the flavor profile of the drink, but too much simply overwhelms it and makes it bitter and a little harsh. 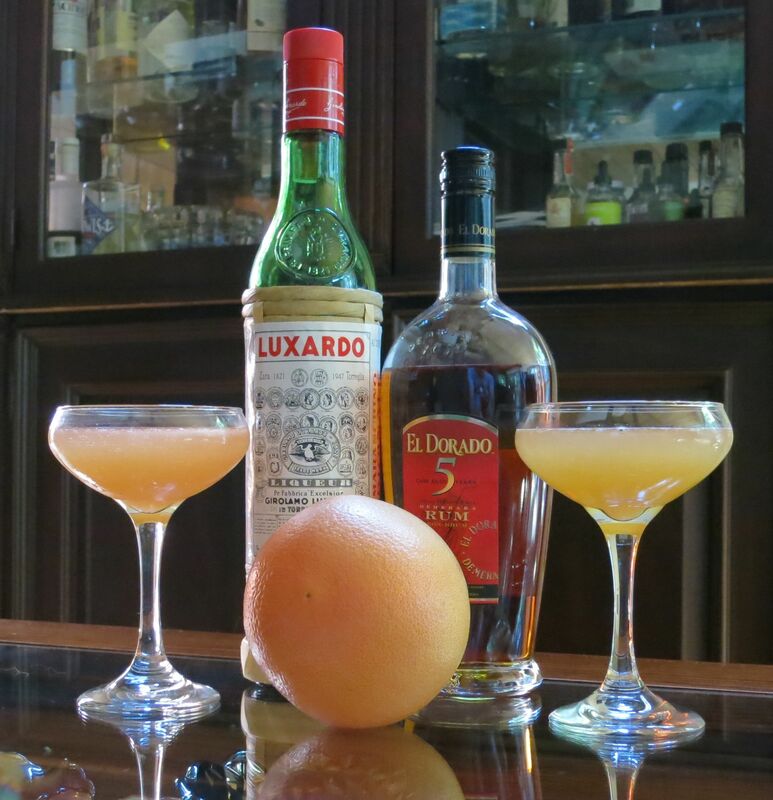 Nose: Caramel, Maraschino, grapefruit, papaya, hints of almond and brine. Palate: Toasty barrel wood and plenty of grapefruit on the intro. More grapefruit, caramel and almond on the mid-palate. Resin-y black cherry and bitter grapefruit on the finish. Nose: Grapefruit is much stronger, other notes are similar to the first version but much more subdued. Palate: Bitter grapefruit underpins everything, start to finish. Strong fresh grapefruit flavor on the start. Chalky sweetness with little bit of almond (think marzipan rolled in powdered sugar) on the mid-palate. A touch of the rum after that, then the bitter grapefruit picks back up. Tasty but very bitter and less nuanced for Christa. Presents a lot more fresh grapefruit flavor for Shaun. For the grapefruit, the comparison wasn’t quite as clear cut. The squeeze juicer version lost some complexity and gained bitterness, but picked up a bit more fresh grapefruit flavor as well. Once again, we decided to try a blend of the two. In this case, a 50/50 blend was best. Nice fresh grapefruit flavor, but the dark sweet barrel notes of the rum still make an appearance. We started this post assuming that the squeeze juicer versions would be better simply because they would have a bit more characteristics from the pith and peel and thus more character. However, when compared side by side, the squeeze juicer versions were overly bitter and tended to remove a lot of the nuance from the drink. So where we ended up was that if you want the “perfect” version, you should do a blend of twist juice and squeeze juice. Squeeze juicing may also be a good choice for getting more flavor out of citrus that is out of season, where the available representatives are somewhat bland and watery. All that said, if you don’t want to be too obsessive about it, pick the juicing method that best matches the drink profile you’re going for. 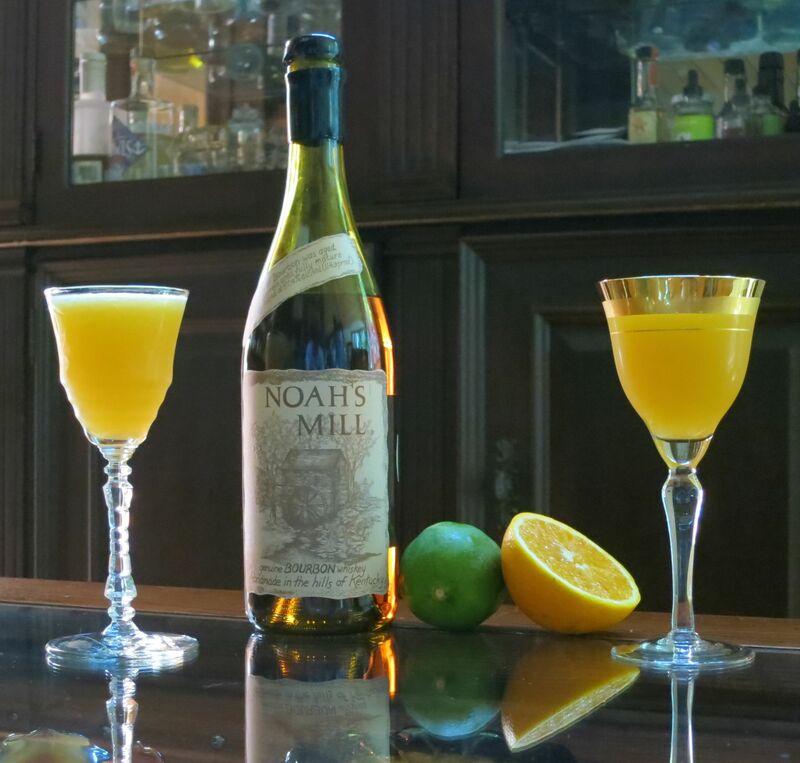 This entry was posted in bourbon, gold rum, grapefruit juice, lime juice, maraschino, orange juice and tagged el dorado rum, frangipani cocktail recipe, louisville cooler cocktail recipe, noah's mill bourbon. Bookmark the permalink.